This article will cover how you perform the Low Pulley Cable Crossover exercise. Since this is an isolation exercise, make sure to program it into your routine after all your compound lifts like bench press and the military press. Before you add this movement into your training program, you should already have a solid foundation of muscle and strength. If you are just starting your fitness journey, your time would be better spent using heavy compound movements instead of isolation exercises like this lift. Step 1: Set the pulleys to the lowest position. Set the stack to the desired weight you plan to use and grab a pulley handle with each hand. Step 2: Take a step forward to put tension on the pulley system. Have your Hands below your waist with the palms facing forwards and your arms almost completely straight. Step 3: Keep a slight bend in your arms and bring your hands upwards and toward the center of your body. Have your palms come together in front of your chest with the palms facing upwards and hold this position while squeezing your chest. Since this exercise uses such a simple movement pattern, it gets rated at a Beginner difficulty level. To perform this exercise, you will need access to a pulley machine with a low pully setting. Most gyms will have this equipment available. If you do not have access to a pulley system, you can still replicate the movement using resistance bands. 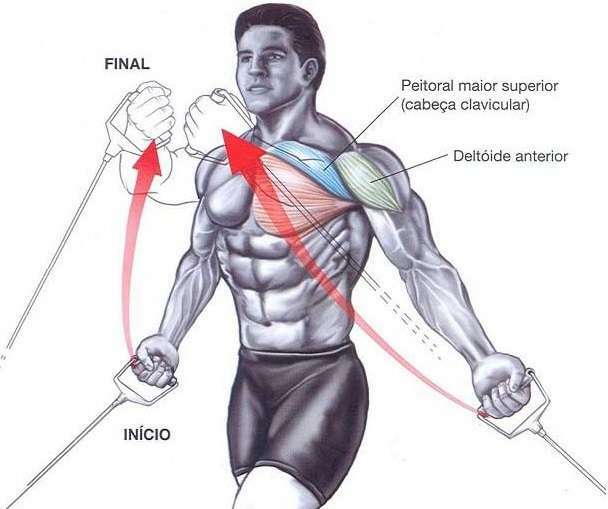 The primary muscle worked by Low Pulley Cable Crossovers are your Upper Chest and the front of the shoulders(Deltoid). Your Core, Upper arms, and forearms are also engaged as stabilizers when you perform this exercise. This lift is a great way to target your upper chest and add some extra definition. Machines like the pulley system tend to have a lower injury rate compared to there free weight counterparts. Keep tension on the cables the entire time. Make sure that you do not jerk the weight up and then have the stack(weights) slam down. Keep your body stiff and stable. The only movement should be at your shoulders. Make sure to take that extra step forward. Having the pulley system slightly behind you will put your body in a better trajectory to target the pectoral muscles. It also helps to ensure your muscles stay under tension the entire time. Since this is an isolation exercise, you are going to want to add it to the end of your routine. Adding it at the end of your routine will ensure your chest is not fatigued for your compound lifts(which should make up the majority of your training). If you are working out at home and don't have access to a pulley station you should try picking up some resistance bands to replicate the movement.